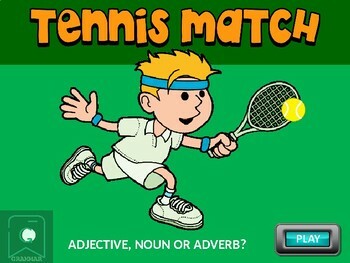 Teach your students the difference between verbs, nouns and adverbs in a funny and entertaining way. It combines pictures (to reinforce the meaning of the sentence) and sounds. It is recommended to be used with a touchscreen or smart board, in this way kids will put ''hands on the matter'' by tapping (or clicking) on the correct answer and will create a positive stimulation towards the assimilation of the concept in them. Please, check on my other great grammar ppt, I am sure they can help you teaching grammar in a funny yet highly productive way.